I have been reading quite a few articles about those “super” affiliates and how much money they are making. But, WHO are those super affiliates, and how much money does it take to actually satisfy somebody who is working the affiliate markets? Oh, I’d be really happy to be one of those who can say they get $5,000/month from affiliate income, but how many of us who have mountains of other work/duties/family have time to sit at the computer 30 hours a day checking the pennies from here, dimes from there and WOW! DOLLARS from somewhere else? Let’s be realistic now. I do have several affiliate programs in place on my websites and I DO make some money from them, but with the limited time I have to actually “work” the programs, I look at it this way: if I get affiliate commissions of $100 or more per month that means (to me) that I have a weeks’ worth of groceries paid for. If I happen to get $75-$80 in a month I’m super happy because that will pay for my water/sewer/garbage AND gas bills!!! Now some months I’ll get $200 – $300 and I’m doing the happy dance because that’ll just about cover my electricity bill! What kind of affiliate programs would work for YOUR particular business? 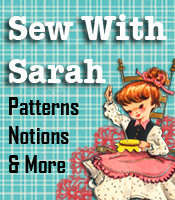 For us in the sewing and crafting business, the logical programs to look at would be JoAnn’s, Fabric.com and perhaps a sewing machine/serger sales company. If you’re in the doll making business perhaps you could find some programs that deal with doll parts that your customers may be interested in, or maybe a good match would be some office supply store – we ALL go through a ton of office supplies. Our Coupon Clutch affiliate program has several hundred affiliates – some of whom are making between $50 and $80 per month. So how are they making that much money from just a few products? The key is to make sure the affiliate “banner” is in a good location on your sidebar, THEN do some regular posts about the product or products from your chosen affiliate program. You like the products from your chosen affiliate programs’ website (we purchase most of our fabric from Fabric.com), so why not let your readers and customers know what YOU prefer. Potential customers always like to have a recommendation from somebody they trust – which would be YOU – so by recommending your favorite products, which happen to have an affiliate program, you will make some extra money as well as having some very satisfied customers who will return to buy more later, and in return give you a little extra cash. So, to answer the question in the title of this post – I have no earthly idea who it is that is making all those super duper affiliate checks — I just know that I’m making enough to help out with our household bills, and in this tough economy that is super duper to me! I don’t understand what actually an affiliate is. Is it a website, (Fab.com) that has a link to yours? Do they pay you by the hit? How do you get hooked up with an affiliate? Don’t get it! Please explain in more detail.